Collierville is a fast growing town near Memphis, Tennessee. Despite rapid growth, it has strived to preserve its heritage and small-town atmosphere. 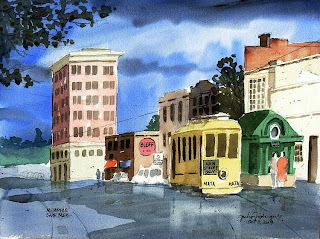 Collierville and the city of Memphis have provided plenty of source material for my watercolor painting hobby. 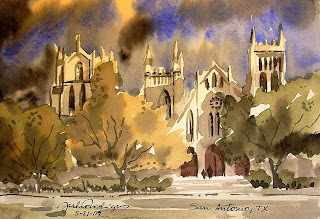 I hope visitors will enjoy browsing through these watercolors of the area as well as other works inspired by places I have been fortunate to visit. More paintings will be added as time permits. Comments and suggestions are welcome. 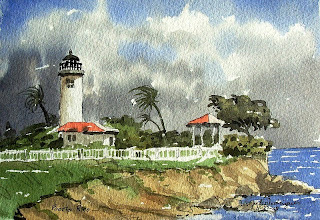 Since I was a young boy, I was a fan of watercolor paintings. The transparent paint allows the light to go through it and to be reflected back to the viewer by the white surface of the paper. This results in a luminosity difficult to achieve through other methods. My favorite subjects are buildings and townscapes of historical interest. 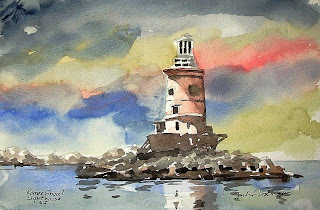 I admire many watercolor masters, especially Winslow Homer, John Pike, James Fletcher-Watson and Edward Wesson. 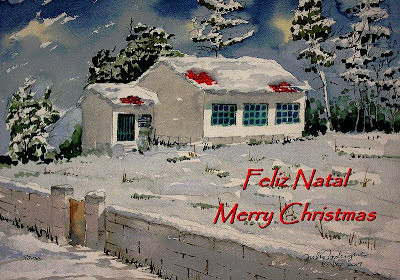 And, from my native Portugal, Roque Gameiro, Alvaro da Fonseca and Julio Amaro. All content is Copyrighted. Please do not reproduce without permission. Thank you for your cooperation. This blog is now closed to new postings. To all the people who visited and left comments, I leave a big Thank You! 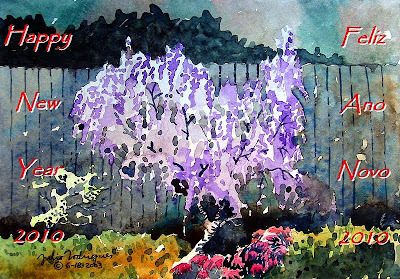 I will continue to post my work from my new home in NY State, and you can find it HERE. 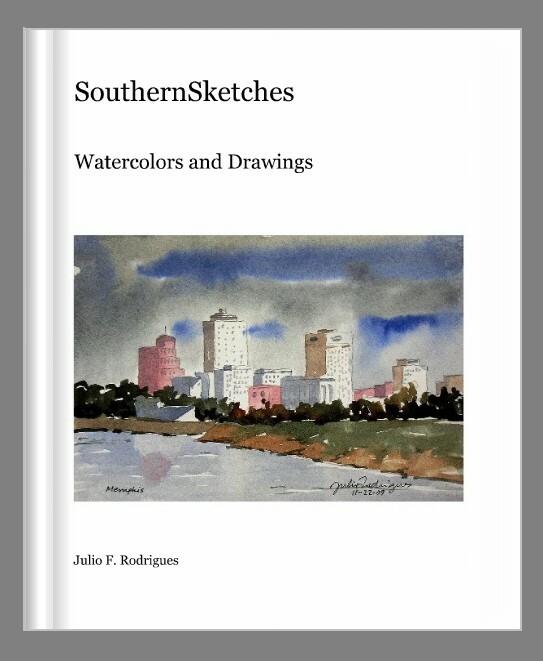 My book, SouthernSketches has been born. Here I gathered my watercolors and drawings of local scenes and landmarks around the Memphis TN area and beyond. It can be reviewed or purchased HERE. 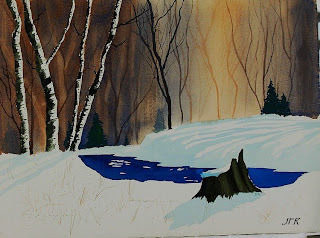 Ok...I found a way to paint really loose...heh, heh...I just paint a tiny (say, 5 x7") watercolor. Then... I crop a tiny portion of it, just like this. Duh! Ok, at least I am trying. The full painting is here. 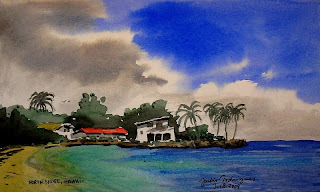 Several years ago I was lucky enough to visit the Island of Puerto Rico. 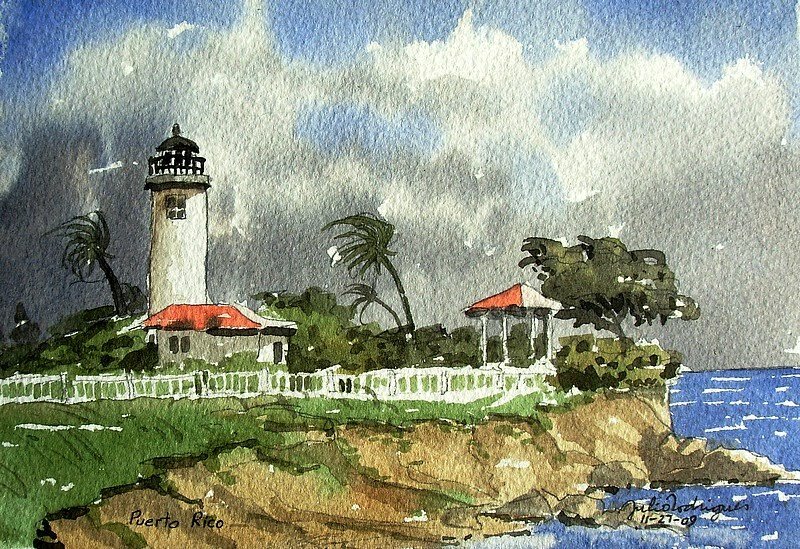 This small watercolor shows the Point Higuero Light in the Northwest corner of the island. Years ago my wife and I finally went on our first cruise. 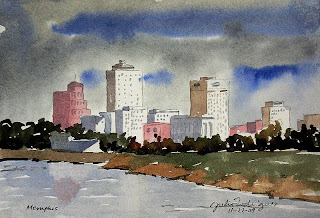 Down the Mississippi River, that is. It took about an hour and a half in a beautiful paddle boat and it offered great views of the Memphis skyline. 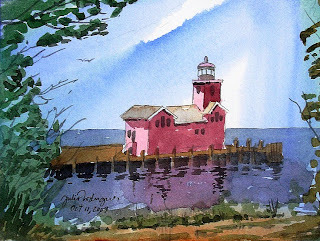 Exact proportions notwithstanding, this small watercolor is loosely based on the Holland Harbor Lighthouse, in Michigan. This is my second watercolor of this place, this time in a little larger size. It is located in South Main Street. Whenever I feel like painting but can't decide what - a barn (duh!) usually materializes. This one came out of my many photographs of farms taken on our long drives to New Jersey. Although the original blue color of the boat does not offer the best contrast with the water, I still decided to use it for this sketch. This is from a visit to the Gulf Shores area in Southern Alabama. Time has been very scarce to paint lately...hopefully that will change soon. So, let's go to the old archives for a change. 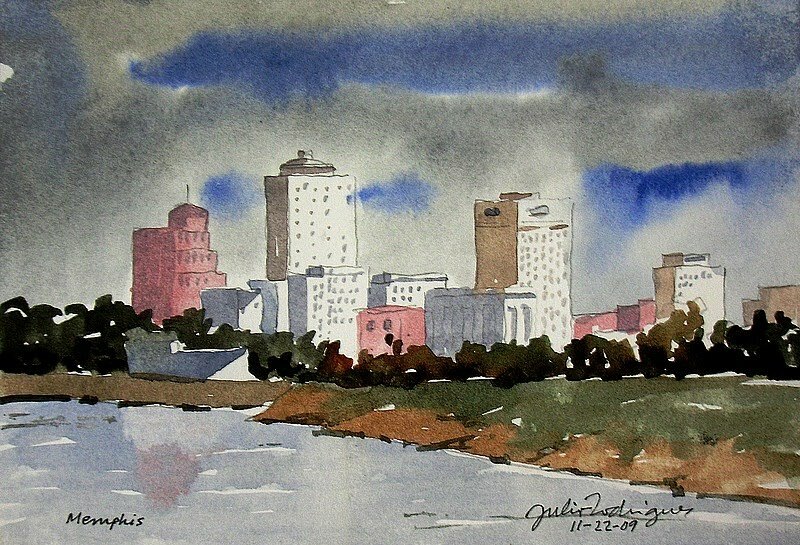 This watercolor was painted many…many…years ago (circa 1985) when my interest in painting in this medium started to bloom. Elizabeth, NJ is my American hometown. Although I was born and raised in Portugal, when I came to the US, this is where I first arrived - after JFK International - in 1974 and where I lived for several years. So it feels like home. 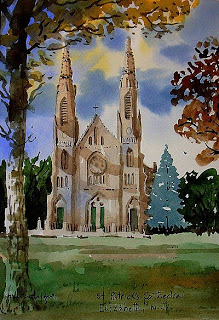 This landmark Cathedral is on 2nd St. in the Elizabethport area. This lonely lighthouse was erected in the early 19th Century just south of Staten Island in New York Bay. 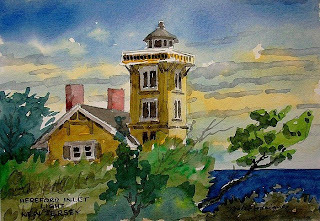 This Lighthouse can be found in the beautiful State of New Jersey near North Wildwood. 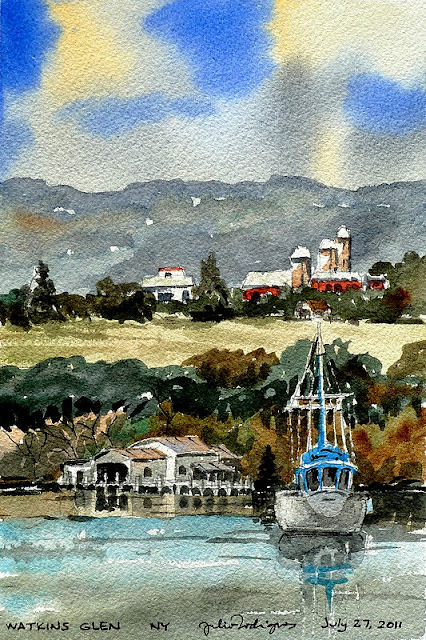 It hints at the abundance of victorian architecture in the southern part of the state. Today, I was rummaging through some photos from some years ago, and I found a scene that made me grab the brush. This is a quick sketch that I clocked at 34 minutes, a little record for me. Some times…rarely for me…speed lends a little freshness and spontaneity, which I think worked in this case. 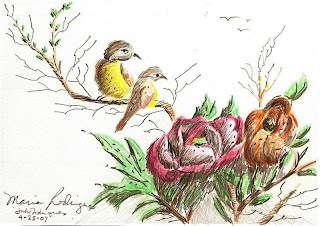 This small drawing was a joint-venture between me and my wife who refuses to acknowledge her obvious talent for drawing and painting. Actually my role was very limited to some shadows in the foreground leaves. She did everything else. I happen to like this a lot. 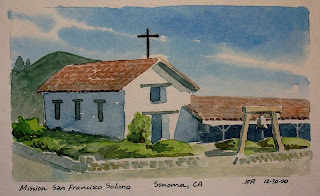 Going back to Sonoma, this is a tiny sketchbook entry from a trip to California many years ago. Along Route 46 in Northwestern New Jersey.